How to Play DAV Files on iPhone XS or iPhone XS Plus? DAV is a DVR365 digital video format and is actually a modified MPEG format and often encrypted, so normal MPEG players or other popular media players or editing programs can not to play or edit DAV files. To play and watch DAV files on iPhone XS (Max), you need to use a video converter to convert DAV to iPhone XS (Max) videos first. UFUSoft DAV to iPhone XS (Max) Converter is just such kind of video converter, a DAV Converter can play or convert DAV files perfectly in every way. Performing as a DAV player, It can play all DAV files on Windows or Mac, just add DAV files or drag and drop DAV files to DAV Player and converter and simply click “Play” button and then you can enjoy DAV files smoothly. If you have more needs, like playing DAV on iPhone, iPad, iPod, HTC, Nokia, Zune, PS3, Xbox, Samsung, Apple TV, PSP, Windows Media Player, VLC, MXplayer, QuickTime, etc or editing DAV on iMovie, Sony Vegas, Adobe, FCP, Pinnacle Studio, Windows Movie Maker, etc or further uploading DAV to YouTube, Vimeo, Twitter, Facebook, etc, you need to use this DAV Converter to convert DAV to other popular video formats, like converting DAV to MP4, convert DAV to AVI, convert DAV to WMV, convert DAV to MPEG, convert DAV to MOV, convert DAV to FLV, etc. 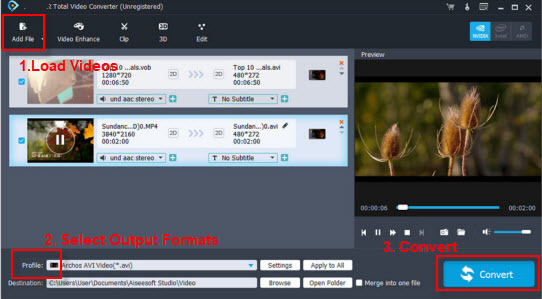 And also if you want to edit DAV files before playing or importing to editing softwares or edit the converted video, this DAV Converter can also satisfy you with its excellent editing features. (See Step 3). In addition, it can also support to extract audio from DAV and then convert the extracted audio to MP3, WAV, WMA, ACC, FLAC, etc. How to Convert DAV to MP4 format for iPhone XS (Max)? Click Add Video icon on the menu bar, or directly drag and drop DAV files for loading video sources. Open Profile box to set output format for iPhone XS (Max), etc. You can choose MP4 from Common Video group, or directly choose a format from iPhone XS (Max) group. If you want to edit DAV or MP4 video, you can click “Effect” button and go to”Trim” tab, “Crop” tab, “Image” tab, “Watermark” tab, “Effect” tab, “Subtitle” tab to finish your basic editing needs. If you have higher editing needs, click “Setting…” button to adjust video bitrate, frame rate, video size, video ratio, audio volume, etc. At last, hit the bottom right convert button to start converting DAV to iPhone XS (Max), etc. The converting would start in no time. After the conversion, you can transfer the converted DAV movies to iPhone XS (Max) etc for unlimited playback and enjoying.